Cripes, can you believe it—after almost two years of writing weekly, I forgot today was Wednesday. Totally and completely blew out of my head. Age? Gooberness? Nothing to say? Nah—just ask Man-Wonder about that one. . .
Truthfully, once again, I’ve been too busy reading—books, articles, blogs, cereal boxes—anything! 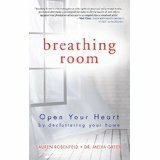 Like, I’m a fan of Cathy Johnson; her style of art and her blog; so when she talked about a book called breathing room, well, I had to check it out. She’s in the midst of clutter-busting and this book is a how-to of getting to the core of cluttering. But, not just physical clutter—it’s also about chucking up the emotional/mental clutter, opening up space in the heart so we can open up space in our living areas. is co-written by Lauren Rosenfeld and Dr. Melva Green. It’s a package deal of humor, real-life stories from people they’ve helped, exercises to do, and spiritual lessons. I’m only up to chapter 15 at this point and already I’ve been requested by Man-Wonder not to bring it to the coffee shop because I keep interrupting his reading. Can I help it when I come across a part that I think he should hear. Remember what I said at the beginning about never having nothing to say! So far, this book is proving to be one of those books I’ve discovered right at the time I am needing it. In the last while I’ve noticed there is way, WAY more coming in to this non-mobile mobile home than there is going out, and it’s beginning to feel stuff-o-cating at times. And, by the way, for those early morning, mid-day, or late evening coffee sits with dear husband, I’ve started taking along Annelise Ryan’s whodunits. They crack me up. She is funny and fresh and clever. So, trust Man-Wonder to complain about them too! He says my laughing is interrupting him . . .
. . . any wonder I call him Man-Wonder ?? ?